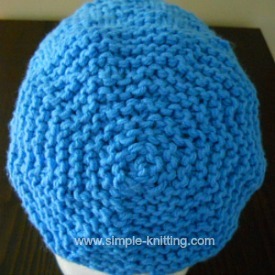 This zigzag hat pattern was really fun to create and knit plus it's a 2-needle pattern for everyone who enjoys them. I wanted something that was a little more fitted and cozy. 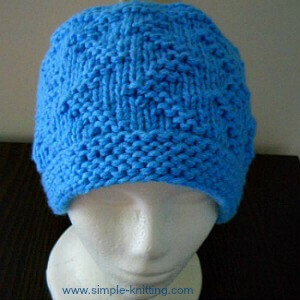 It's an easy fun knitting hat pattern using simple knit and purl stitches so it's quite simple to knit. And since it has some shaping to it, it would be more suitable for advanced beginners. By that I mean the pattern has the (K2tog) knit 2 together decrease . If you're a new knitter and you'd really like to practice knits and purls...that's great! The pattern isn't too difficult. Although you may like to review how to knit the K2tog decrease. Then you'll be set to try out my zigzag hat pattern too. Pattern Notes: I wanted this zigzag hat to be warm and cozy so I held 2 strands of yarn together, one strand from the inside of the skein and the other strand from the outside. When you knit with the 2 strands just knit as if its one strand. If you prefer you could also use a chunky yarn being careful to match the knitting gauge. This is the stitch pattern used. The hat pattern is just below. Holding 2 strands of yarn together cast on 74 sts. Work 2 complete stitch patterns (above) for the body of the hat. Knit next 2 rows as well. Work should measure approximately 6" from cast on edge. Over the next 17 rows you will be decreasing stitches in order to make a nice round flat top to your hat. Each decrease row is followed by a knit row. Cut yarn. Thread yarn into tapestry needle and pull through the last 4 sts. Make sure to put tapestry needle through the last stitch on your needle first. Pull tight.